Before modern devices such as laptops and mobile phones were invented, a “computer” was a person who did calculations. 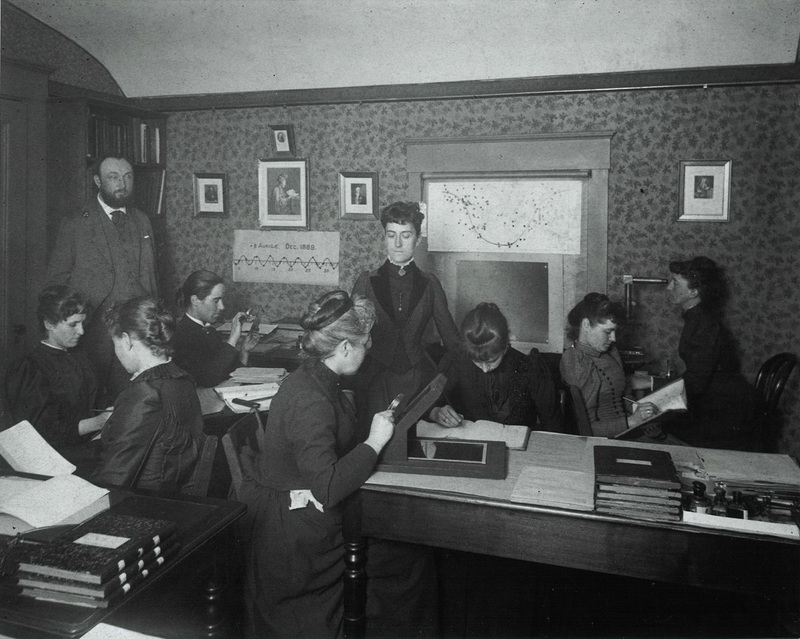 At the Harvard College Observatory, between the late 19th century and early 20thcentury, several dozen women were “computers” who helped lay out some of the fundamental assumptions of astronomy. Their job was to look over photographic plates of the night sky and compare the positions of stars between one plate and another. The computers were mainly hired by Edward Charles Pickering, who was director of the observatory from 1877 to 1918. According to Smithsonian magazine, Pickering expanded astrophotography shortly after the new plate technology was made easily available. He was initially caught short, however, when the number of plates produced exceeded the number of people he had on staff to analyze the images. Because looking at plates for hours on end was considered boring and unspecialized work, Pickering turned to women to perform the duties. At the time, women were rarely employed outside of the home and were believed to be best suited to managing households. While Pickering’s employment was a jump forward for these women, they remained mainly in clerical roles – showing that women’s status in astronomy had a long way to go in the early 20th century. The women worked full days for six days a week, being paid between 25 cents and 50 cents an hour. This was far less than what a man would have been paid, and in some cases the women hired were not specialists in astronomy. All told, a few dozen women (reported as anywhere between 40 and 80) were hired over the decades and were informally known as “Pickering’s Harem” – a term that today would be considered derogatory. In other ways, however, Pickering helped to pioneer modern astronomy. At the time, most observations were done mainly by humans looking through telescopes. Pickering, the Smithsonian wrote, believed that the human eye would get tired over time and may not make accurate measurements. Photographs would provide the opportunity to look at swatches of the sky repeatedly, and could help establish such fundamentals such as which stars were brighter than other ones. One of the first computers was Pickering’s maid (and a former teacher), according to the American Museum of Natural History. Williamina Fleming is today best known for finding the Horsehead Nebula and also for classifying the stars depending on their temperature. 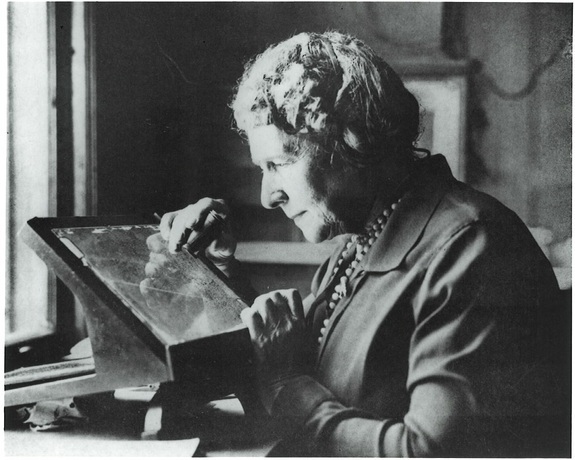 Thanks to her, the first Draper Catalogue of Stellar Spectra was published in 1890 showing the brightness, star type and position of more than 10,000 stars, according to Harvard. Henrietta Swan Leavitt also had studied astronomy at Harvard, and was hired in 1907 to look at variable stars. According to Harvard, she commonly would place one photographic plate on top of another to see how the brightness in certain stars changed between exposures. She found roughly 2,400 variable stars, and also discovered Cepheid variables. These are stars that have a consistent luminosity, which makes them handy “measuring sticks” to figure out the universe’s expanse. Although not a “computer,” Cecilia Payne-Gaposchkin achieved a noteworthy feat in 1925: she was the first person to get a doctorate in astronomy from Harvard, although her degree was officially issued from Harvard’s affiliate female institution, Radcliffe College, Harvard wrote. (Women were accepted into Harvard only in 1977). Payne-Gaposchkin discovered that the sun’s atmosphere is mostly hydrogen, which went against the established thinking of the time that the sun and the Earth shared a similar composition. Payne-Gaposchkin went on to become the first female full professor in Harvard’s faculty of arts and science, then the first female chair at Harvard – in astronomy. Pickering appointed Cannon curator of astronomical photographs in 1911, although the Harvard president of the time wouldn’t let her be put in the staff catalog. Her appointment was finally made official in 1938. She won multiple awards for her work before retiring in 1940. She died in 1941. The photography plate collection program at Harvard continued until 1992, except for a shutdown for a few years in the 1950s known as the “Menzel Gap” (after its director at the time, who stopped it due to budgetary concerns). By the 1990s, photographic plates were rapidly being supplanted by more advanced technologies, such as the CCDs that are commonly used in digital cameras today. The plate archive, however, remains available for astronomical research and is also being digitized. The ESA/NASA Solar and Heliospheric Observatory spacecraft captured this image of a coronal mass ejection erupting on the sun on Sept. 30, 2015. Material from the sun may have caused Comet 67P/Churyumov-Gerasimenko to flare up nearly 100 times brighter than average in some parts of the visual spectrum, new research reports. At about the same time that charged solar particles slammed into Comet 67P, the European Space Agency’s (ESA) Rosetta spacecraft observed that the icy wanderer dramatically brightened. Initially, scientists assumed that unusual effect came from jets of material within the comet. 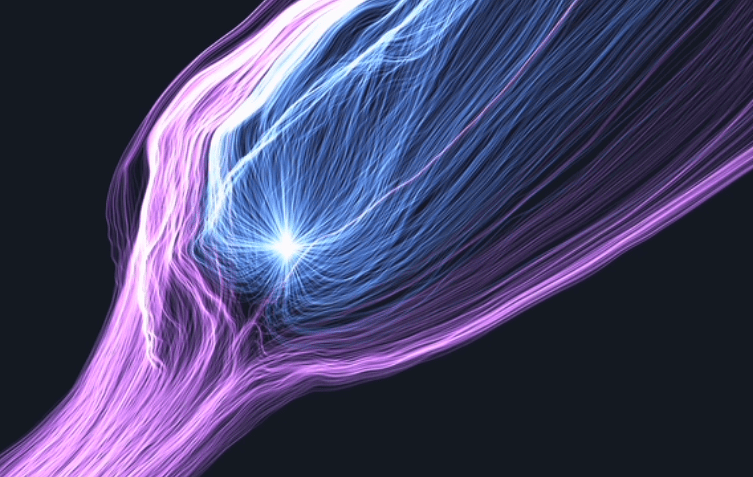 However, newly released observations of 67P suggest that a burst of charged particles from the sun, known as a coronal mass ejection (CME), could have caused the change. “The [brightening] was characterized by a substantial increase in the hydrogen, carbon and oxygen emission lines that increased by roughly 100 times their average brightness on the night of Oct. 5 and 6, 2015,” John Noonan told Space.com. Noonan, who just completed his undergraduate degree at the University of Colorado at Boulder, presented the research at the Division for Planetary Sciences meeting in Pasadena, California, in October. After reading a report of a CME that hit 67P at the same time, Noonan realized that the increased emissions from water, carbon dioxide and molecular oxygen observed by Rosetta’s R-Alice instrument could all be explained by the collision of the comet with material jettisoned from the sun. “This doesn’t yet rule out that an outburst could have happened, but it looks possible that all of the emissions could have been caused by the CME impact,” Noonan said. Rosetta entered orbit around Comet 67P in August 2014, making detailed observations until the probe deliberately crashed into the icy body at the end of its mission in September 2016. As 67P neared the sun, newly warmed jets began to release gas from the surface, building up the cloud of debris around the nucleus known as the coma. Jets continued to spout throughout Rosetta’s observations as different regions of the comet rotated into sunlight. Such spouts were initially credited with the extreme brightening that took place in October 2015. In addition to warming the comet, the sun also interacted with it through its solar wind, the constant rush of charged particles streaming into space in all directions. Occasionally, the sun also blows off the collections of plasma and charged particles known as CMEs. When CMEs collide with Earth, they can interact with the planet’s magnetic field to create dazzling auroral displays; this interaction can also damage power grids and satellites. Niklas Edberg, a scientist on the Rosetta Plasma Consortium Ion and Electron Spectrometer instrument on the spacecraft, and his colleagues recently reported that RPC/IES observed a CME impact on Rosetta at the same time as the bizarre brightening. 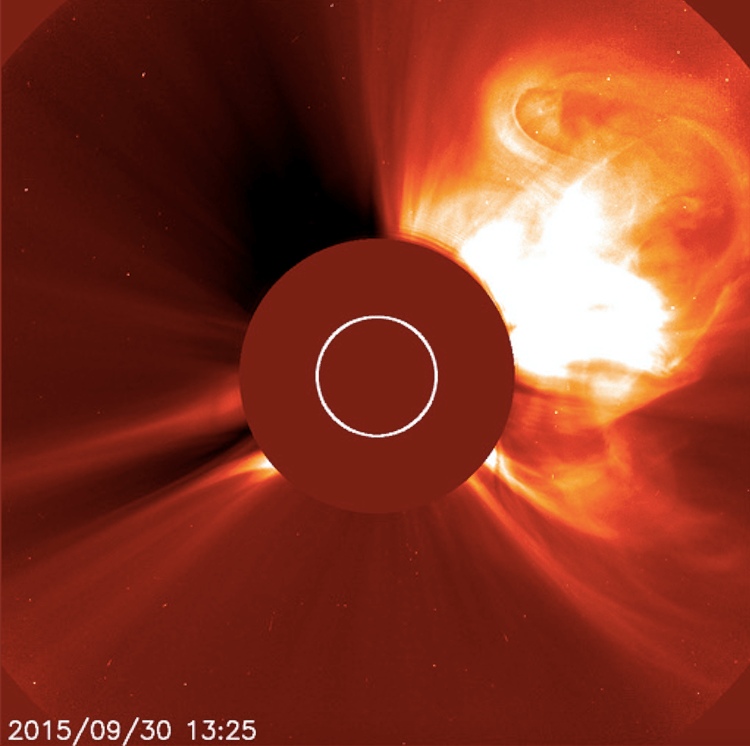 The ESA/NASA Solar and Heliospheric Observatory (SOHO) spacecraft detected the CME as it left the sun on Sept. 30, 2015. According to Edberg, the CME compressed the plasma material around the comet. Because Rosetta was orbiting within the coma, the probe hadn’t sampled any material streaming from the solar wind since the previous April, and wasn’t expected to do so for several more months. When the CME slammed into the comet, however, the coma was compressed and Rosetta briefly tasted part of the solar wind once again. “This suggests that the plasma environment had been compressed significantly, such that the solar wind ions could briefly reach the detector, and provides further evidence that these signatures in the cometary plasma environment are indeed caused by a solar wind event, such as a CME,” Edberg and his team wrote in their study, which was published in the journal Monthly Notices of the Royal Astronomical Society in September 2016. For Noonan, the realization that a CME had impacted the comet at the same time of its unusual brightening had an illuminating effect. “I read this [Edberg et al.] paper and realized that the substantial increase in electron density could account for the increased emissions from the coma that R-Alice observed, and set about testing what the density of the coma’s water, carbon dioxide and molecular oxygen components would have to be to match what we saw,” Noonan said. Charged particles from the CME may have excited cometary material, causing it to release photons, he added. Some of the observed changes could be created only by interacting electrons, causing what Noonan called “unique fingerprints” that let the scientists know electrons were impacting the material. Of special importance was the transition of oxygen line in the spectra, a change that can only be caused by electrons. “During the course of the CME, we saw this line increase in strength by roughly hundredfold,” Noonan said. The charged particles were unlikely to have come from the solar wind, which Noonan said would be blocked from ever penetrating this deep. While CMEs have been observed around other comets, they have only been viewed remotely. From such great distances, only large-scale changes in the comets’ comas and tails could be observed, Edberg said. Over the course of its two-year mission at Comet 67P, Rosetta’s close orbit allowed it to observe other CMEs interacting with the comet, but Noonan said none were as noticeable as the event of Oct. 5-6, 2015. “Prior to Rosetta, these electron impact emissions had never been observed around a comet, and it was these emissions that gave away that the CME might be a factor in causing them,” Noonan said. He cautioned that it isn’t a given that the influx of charged particles caused the bizarre brightening, which still could be caused by the jets of material. “At this point, we are still working to understand exactly what was the cause to see if it was the CME, and outburst, or both, that caused the emission,” Noonan said. Given the timing of the impact, however, it is unlikely that the flare-up was the result of gas released by jets alone. “There are more forces at play than just a higher density of gas,” Noonan said. Ultra-diffuse galaxies are as faint as dwarf galaxies, but spread over an area the size of the Milky Way — with about 1/1000th the number of stars. A new simulation suggests many supernovas at the beginning of a galaxy’s life can push the stars and dark matter outward to a great size. Two simulated ultra-diffuse galaxies are pictured here on top of a Hubble Space Telescope image of background galaxies. Like ghosts, ultra-diffuse galaxies often float undetected in the night sky — stretching the size of the Milky Way, but containing only a dwarf galaxy’s worth of stars. Now, a new simulation suggests their explosive origins, and hints that there may be many more than seen so far. Researchers uncovered the first ultra-diffuse galaxy in 2015, and were puzzled by how the faint galaxy came to have such a large size with so few stars. Since then, they’ve spotted many more with the most sensitive telescopes, mostly in large clusters of many galaxies. But this new research suggests that internal dynamics in a forming galaxy, rather than processes happening within clusters, can blow a dwarf up to enormous, spread-out size — and thus they may pepper the universe even far from large clusters, hiding in plain sight because of their faintness. 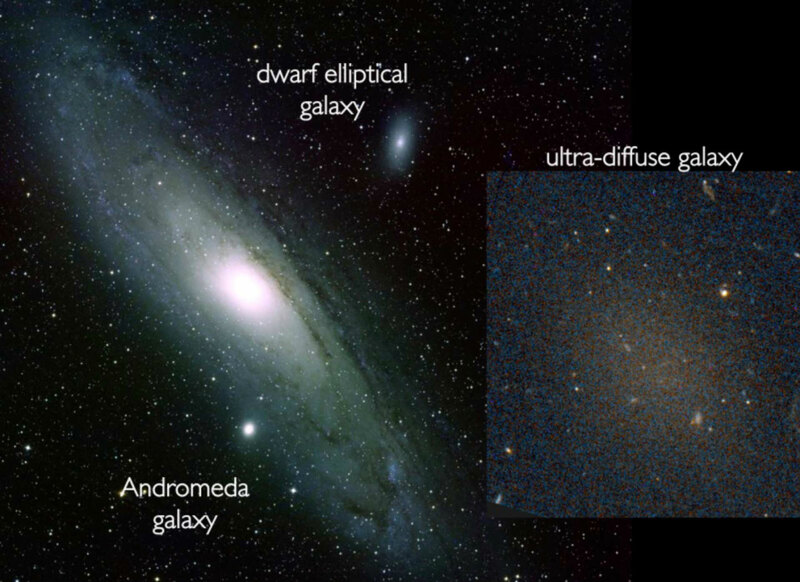 The ultra-diffuse galaxy Dragonfly 17, shown in comparison to the large Andromeda galaxy and the elliptical dwarf galaxy NGC 205. An international collaboration called NIHAO — the Numerical Investigation of a Hundred Astronomical Objects — simulated the formation of 100 galaxies in extreme detail, tracking the way gases, forming stars and dark matter interacted within the systems. Within that 100, they found some that matched the profile of the newly discovered ultra-diffuse galaxies. So they worked backward to discern what had caused them — not big galaxies failing and growing faint, but dwarf galaxies stretched to an extraordinary size. “Once stars explode supernovae, they release a lot of energy into the surrounding gas, and this gas can be expelled really, really fast,” Arianna di Cintio, a researcher at University of Copenhagen’s DARK Cosmology Center and lead author on the new work, told Space.com. If dwarf galaxies experience enough of these supernovas early on in their lives, she said, the galaxy can balloon outwards, borne on the outflows of gas. Thus, the galaxies’ few million stars puff up to fill a space that could ordinarily host about 1,000 times that number. It’s easier to find ultra-diffuse galaxies in big galaxy clusters because that’s where the most powerful telescopes set their sights — for instance, the National Astronomical Observatory of Japan’s Subaru telescope found 854 of them in the Coma Cluster, according to a statement by the university’s Niels Bohr Institute. Just a few have been found so far floating on their own, di Cintio said. 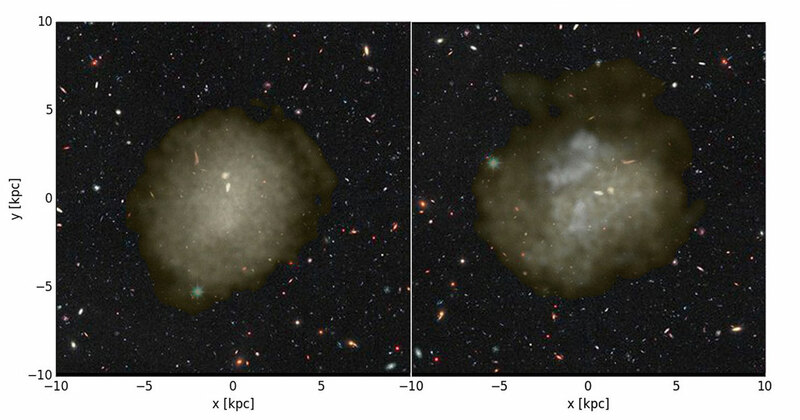 Di Cintio said the next steps are to try and verify more ultra-diffuse galaxies living on their own, outside of big clusters, and to measure their mass — potentially through gravitational lensing — to help verify that they’re really dwarf-galaxy-mass. In general, further research will help researchers discover extremely faint, low-surface-brightness galaxies that may lurk in our telescopes’ fields of view. The new work was detailed Nov. 29 in the journal Monthly Notices of the Royal Astronomical Society. “Star Trek” technologies are starting to become a reality in our everyday lives; just ask anyone who owns a cellphone or tries a virtual reality headset. But how real are these “Star Trek” technologies in space today, 50 years after the iconic science fiction series’ TV debut? While the tech for warp drives and transporters remains elusive, NASA is using some technology in space that would be at home on the starship Enterprise. One key way NASA is emulating “Star Trek” is by finding ways for humans to spend years in space without requiring constant resupply missions from Earth, said Jason Crusan, NASA’s director for advanced exploration systems. This means using the International Space Station as a test bed for technology that can extend an astronaut’s stay in space and thus could be used one day on the long journey to Mars. Space station astronauts already drink water mostly recovered from urine, but NASA wants to push its recovery rate (now in the 80 percent range) even further, Crusan said. “Humans have a lot of salt in our waste,” Crusan told Space.com. So, in late June, NASA awarded Paragon Space Development Corp. a $5.1 million contract to create a Brine Processor Assembly for flight in 2018. This assembly is expected to remove brine and recover up to 94 percent of the water from urine, NASA officials said in a statement. Ongoing technology developments also allow astronauts to manufacture their own tools using 3D printing and to use atmospheric monitors to check the air in the cabin environment for contaminants. Those monitors shrink huge gas chromatography mass spectrometry units, which identify different substances in test samples, to about the size of a toaster. All of these are important considerations in sending a future crew to Mars in an Orion spacecraft, along with one to three other habitat modules attached to provide extra room, Crusan said. This “Orion plus” spacecraft would likely have solar electric propulsion capability — engines that ionize noble gases to give a small amount of thrust and run for long periods of time, Crusan said. 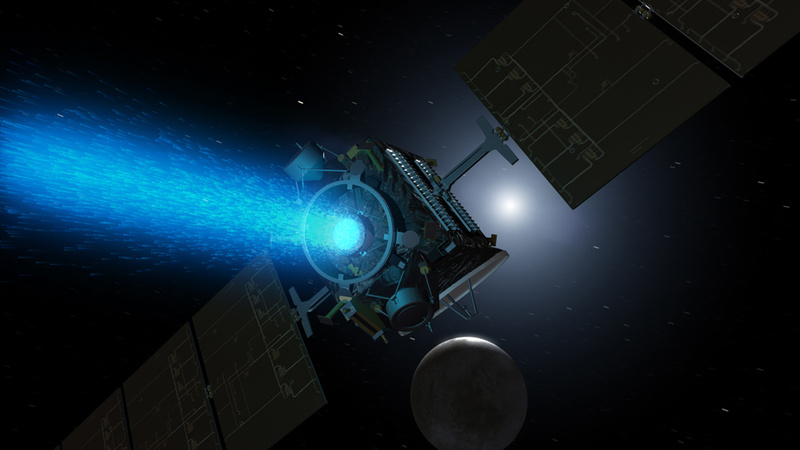 One form of solar electric propulsion is an ion drive, which was used for the Dawn spacecraft now orbiting the dwarf planet Ceres. Ion drives were mentioned specifically in some “Star Trek” episodes, said David Allen Batchelor, a member of the radiation effects and analysis group at NASA’s Goddard Space Flight Center in Greenbelt, Maryland. Batchelor recently republished a list of “Star Trek” technologies used in real life; this list has been available in different versions on NASA’s website since 1993, and he is asked to update it every once in a while, he told Space.com. Indeed, there have been several recent additions to that list. Lasers have been used to send test communications to the moon. NASA is simulating its new space transportation system using supercomputers. “Super-telescopes,” such as Kepler and the Hubble Space Telescope, are discovering and exploring strange new worlds from a distance. And there are even androids (of a sort) on Mars. “Although they’re not shaped like Mr. Data, the Curiosity rover and rovers like that are actually robotic,” Batchelor said. The Mir space station, which operated from 1986 to 2001, experienced a serious fire late in its operational phase, so NASA and its Russian partners on the International Space Station are well aware of the danger that fire poses to human lives in space. But fire behaves much differently in microgravity, and of course, no one wants to conduct tests near astronauts. Understanding how to mitigate fire is one of the biggest ways to keep astronauts safe for long periods of time. Saffire-II will look at nine smaller segments, and Saffire-III will have a large sample again. By the fourth, fifth and sixth increments, NASA plans to bring a combustion product monitor along to monitor the experiment — it’s an advanced version of a smoke detector, Crusan said. It uses lasers to look at the chemical compounds emitted even before humans are aware there is smoke. During a “Trek Talk” panel discussion at “Star Trek”: Mission New York on Sept. 4, 2016, Michelle Thaller, deputy director of science communications at NASA’s Goddard Space Flight Center, discussed how the advanced technologies of “Star Trek” are being explored in modern physics labs today. The idea behind being able to change the nature of space-time to travel faster than the speed of light — the fundamental concept behind a warp drive — “may turn out to be the real foundation of the next phase of modern physics,” Thaller said. Additional reporting by Samantha Mathewson, Space.com staff writer, from New York City. 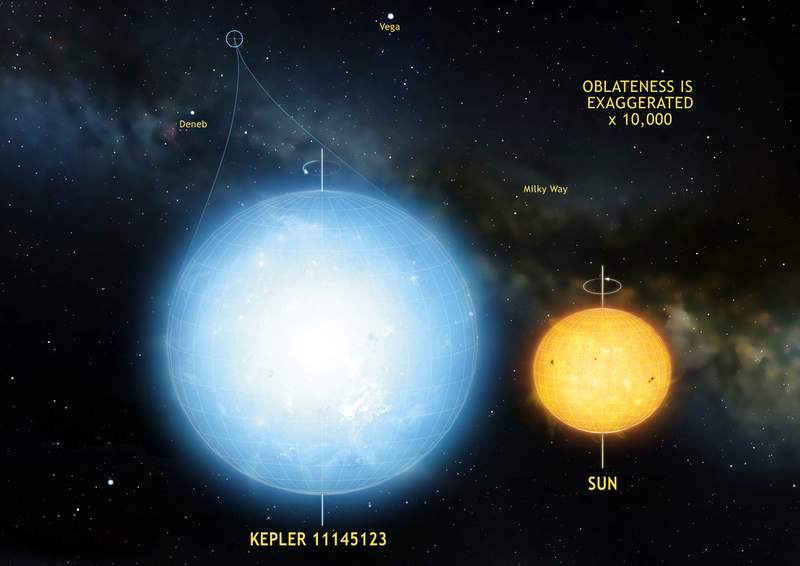 The star Kepler 11145123 is the roundest natural object ever measured in the universe. Stellar oscillations imply a difference in radius between the equator and the poles of only 3 km. This star is significantly more round than the Sun. Credit: © Laurent Gizon et al. and the Max Planck Institute for Solar System Research, Germany. Illustration by Mark A. Garlick. A star 5,000 light-years from Earth is the closest thing to a perfect sphere that has ever been observed in nature, a new study reports. Stars, planets and other round celestial bodies bulge slightly at their equators due to centrifugal force. Generally speaking, the faster these objects spin, the greater the force, and the larger the bulge. For example, the sun rotates once every 27 days, and an imaginary line drawn through its center at the equator is about 12 miles (20 kilometers) longer than a similar line drawn from pole to pole. The equatorial diameter of Earth, which completes a rotation every 24 hours, is 26 miles (42 km) longer than the polar diameter, even though Earth is much smaller than the sun. But the distant star, known as Kepler 11145123, has Earth, the sun and every other object that’s ever been measured beat in terms of roundness, study team members said. The team, led by Laurent Gizon from the Max Planck Institute for Solar System Research and the University of Göttingen in Germany, then used this information to determine the star’s size. This technique is known as asteroseismology, because it allows astronomers to probe stellar interiors in much the same way that geologists use earthquakes to study our planet’s insides. The researchers found that Kepler 11145123’s equatorial and polar diameters differ by a mere 3.7 miles (6 km), even though the star is 1.86 million miles (3 million km) in diameter — about twice as wide as the sun. “This makes Kepler 11145123 the roundest natural object ever measured, even more round than the sun,” Gizon said in a statement. Why is the star so round? It rotates about three times more slowly than the sun, but that’s probably not the whole story. Magnetic fields can also help flatten stars, so part of the answer may lie in Kepler 11145123’s magnetic environment, astronomers said. There’s no guarantee that Kepler 11145123 will keep its roundness record forever. 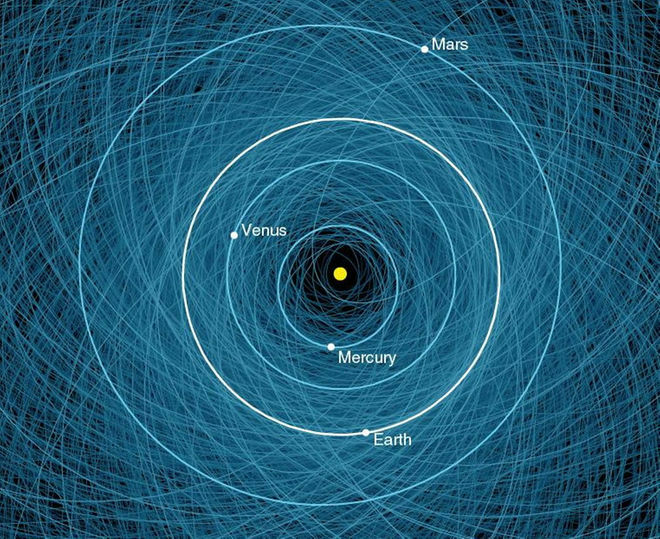 Gizon and his colleagues plan to study other stars using their asteroseismological techniques, which they said have delivered unprecedented precision and may therefore open up new lines of inquiry. The new study was published today (Nov. 16) in the journal Science Advances. Gamma-ray bursts (GRBs) are the brightest electromagnetic blasts known to occur in the universe, and can originate from the collapse of the most massive types of stars or from the collision of two neutron stars. Supernovae are stellar explosions that also can send harmful radiation hurtling towards Earth. Both GRBs and supernovae are usually observed in distant galaxies, but can pose a threat if they occur closer to home, where they can strip the Earth’s upper atmosphere of its protective ozone layer leaving life exposed to harmful ultraviolet radiation from the sun. A new paper, titled “Ground-Level Ozone Following Astrophysical Ionizing Radiation Events – An Additional Biological Hazard?” published in the journal Astrobiology took a look at the ramifications of a nearby GRB or supernova and the effects on life. The research was funded by the Exobiology and Evolutionary Biology element of the NASA Astrobiology Program. 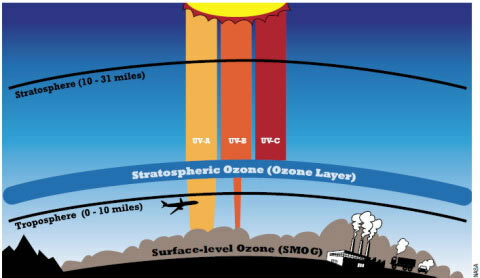 Normally, the ozone layer in the upper atmosphere shields the Earth’s surface from harmful ultraviolet light. But a GRB or supernova would quickly eviscerate that layer. As the UV rays penetrate the planet’s surface they would break apart oxygen molecules and ground-level ozone would form, according to Washburn University astrophysicist Brian Thomas. We see this kind of ozone on hot, polluted days when smog alerts warn us to stay indoors for health reasons. But would the ground-level ozone created after a GRB pose a longterm biological threat? Thomas and his colleague Byron Goracke investigated the severity of this ground-level ozone and its potential effects on life using an atmospheric model to simulate a particular case of a GRB occurring over the South Pole. This is because the radiation produces chemical changes in the middle atmosphere, and atmospheric transport from this region is mainly towards the pole making the effect of the GRB most extreme in this location. A burst at the South Pole fits in with theories of the Ordovician extinction because the measured extinction rates match the models that predicts latitude-dependent biological damage. Thomas and his team of researchers used computer models to determine that the amount of ozone present in the lower atmosphere following a GRB concentrated on the South Pole is around 10 parts per billion (ppb) and this amount varies with the seasons. However, it takes at least 30 ppb of ozone to increase the risk of death due to respiratory failure in humans. Ground-level ozone can also damage plants by reducing chlorophyll production or killing the cells outright, but once again there needs to be at least 30 ppb in the atmosphere before ozone becomes a risk to vegetation. Ozone is also water soluble, which is particularly relevant to the Ordovician mass extinction as most life at the time was marine life. If all of the 10 ppb of ozone generated by a GRB became dissolved in the oceans, it would still only have a very minor impact, if any, on some bacteria and fish larvae, and wouldn’t have played a part in the Ordovician mass extinction. It’s quite clear, therefore, that a GRB event alone does not cause the kind of elevated ground-level ozone that’s deadly to life. There are some things in the universe that you simply can’t escape. Death. Taxes. Black holes. If you time it right, you can even experience all three at once. Black holes are made out to be uncompromising monsters, roaming the galaxies, voraciously consuming anything in their path. And their name is rightly deserved: once you fall in, once you cross the terminator line of the event horizon, you don’t come out. Not even light can escape their clutches. But in movies, the scary monster has a weakness, and if black holes are the galactic monsters, then surely they have a vulnerability. Right? Well, general relativity is a super-complicated mathematical theory. Quantum mechanics is just as complicated. It’s a little unsatisfying to respond to “How?” with “A bunch of math,” so here’s the standard explanation: the vacuum of space is filled with virtual particles, little effervescent pairs of particles that pop into and out of existence, stealing some energy from the vacuum to exist for the briefest of moments, only to collide with each other and return to nothingness. Here’s the thing: I don’t find that answer especially satisfying, either. For one, it has absolutely nothing to do with Hawking’s original 1974 paper, and for another, it’s just a bunch of jargon words that fill up a couple of paragraphs but don’t really go a long way to explaining this behavior. It’s not necessarily wrong, just…incomplete. Let’s dig into it. It’ll be fun. First things first: “Virtual particles” are neither virtual nor particles. In quantum field theory — our modern conception of the way particles and forces work — every kind of particle is associated with a field that permeates all of space-time. These fields aren’t just simple bookkeeping devices. They are active and alive. In fact, they’re more important than particles themselves. You can think of particles as simply excitations — or “vibrations” or “pinched-off bits,” depending on your mood — of the underlying field. Sometimes the fields start wiggling, and those wiggles travel from one place to another. That’s what we call a “particle.” When the electron field wiggles, we get an electron. When the electromagnetic field wiggles, we get a photon. You get the idea. Sometimes, however, those wiggles don’t really go anywhere. They fizzle out before they get to do something interesting. Space-time is full of the constantly fizzling fields. In their complex interaction and partial entrapment with the newly forming black hole, the temporary fizzling fields get “promoted” to become normal everyday ripples — in other words, particles. So, Hawking Radiation isn’t so much about particles opposing into existence near a present-day black hole, but the result of a complex interaction at the birth of a black hole that persists until today. 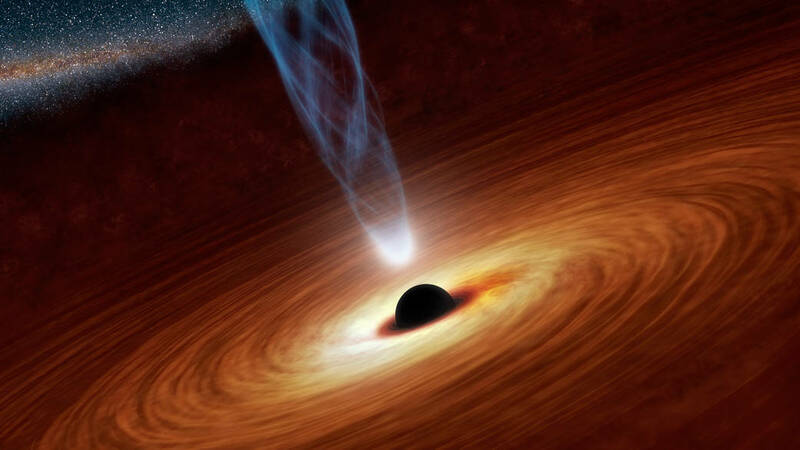 One way or the other, as far as we can tell, black holes do dissolve. I emphasize the “as far as we can tell” bit because, like I said at the beginning, generality is all sorts of hard, and quantum field theory is a beast. Put the two together and there’s bound to be some mathematical misunderstanding. But with that caveat, we can still look at the numbers, and those numbers tell us we don’t have to worry about black holes dying anytime soon. A black hole with the mass of the sun will last a wizened 10^67 years. Considering that the current age of our universe is a paltry 13.8 times 10^9 years, that’s a good amount of time. But if you happened to turn the Eiffel Tower into a black hole, it would evaporate in only about a day. I don’t know why you would, but there you go. NASA and other organizations do regular scans of the sky to catalog any small bodies that are at risk of crashing into our planet. No imminently threatening bodies have been found yet, but it’s clear that sooner or later Earth will be struck by something big. The organizations are actively researching the best ways to protect Earth from asteroids, meteoroids or comets that may come crashing down. Asteroids refer principally to small, rocky bodies. Comets contain more ice and can also pose a threat to Earth. Before fragments enter our atmosphere, they are known as meteroids. During their path in the atmosphere, they are called meteors. If any of these pieces reach the ground, those pieces are called meteorites. The best hunting ground on Earth for meteorites is Antarctica because the ice makes it so easy to see the fragments, and the ground is not disturbed as much as a typical urban area or forest. The difference between a meteroid and an asteroid is a little vague. In 1961, The International Astronomical Union (the official body for naming objects in space) said a meteroid is much smaller than an asteroid, but bigger than an atom. A 2010 Meteoritics and Planetary Science paper led by Alan Rubin, a geophysicist at the University of California, Los Angeles, suggested that the limit for meteoroids be about 1 meter in size. It is clear that even small bodies can pose a threat; the asteroid that broke up over Chelyabinsk, Russia, in 2013 was roughly 56 feet (17 meters) across, shattering glass and injuring hundreds of people. In 1908, an estimated 130-foot (40-meter) object exploded over Siberia and flattened trees over 825 square miles (2,137 square kilometers). Around 50,000 years ago, before human civilization began, a rock about 150 feet wide (46 meters) smacked into what is now called Arizona. It left behind Meteor Crater, which is roughly 0.7 miles (1.2 kilometers) wide today. NASA began tracking near-Earth objects (NEOs) in the 1970s. Its goal is to find objects that are at least tens of meters in size, “which could cause significant harm to populated areas on the Earth if they were to strike without warning,” NASA stated in 2014. Congress directed NASA in 1994 to find at least 90 percent of potentially hazardous NEOs larger than 0.62 miles (1 kilometer) in diameter, which NASA fulfilled in 2010. Congress also asked NASA in 2005 to find at least 90 percent of potentially hazardous NEOs that are 460 feet (140 meters) in size or larger. That’s supposed to be finished by 2020. NASA created a Planetary Defense Coordination Office in 2014 — a year after Chelyabinsk — to better coordinate its efforts, in response to an Office of the Inspector General report. Other space agencies such as the European Space Agency also have their own offices, and the different nations regularly collaborate with each other. 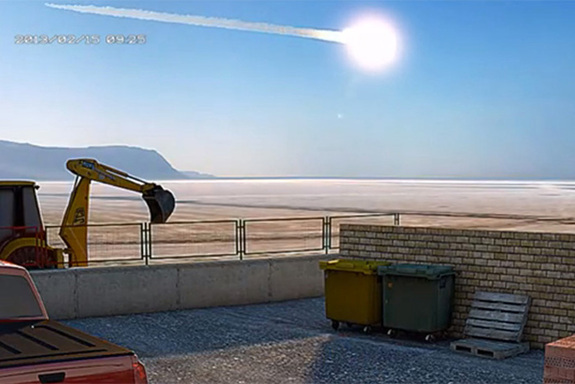 An artist’s concept for the Asteroid Impact & Deflection Assessment (AIDA) mission led by the European Space Agency to intentionally strike an asteroid and test deflection capabilities that could protect Earth. NASA works with several sky surveys to maintain a list of potentially hazardous objects. These include the Catalina Sky Survey (University of Arizona), Pan-STARRS (University of Hawaii), Lincoln Near-Earth Asteroid Research or LINEAR (Massachussetts Institute of Technology) and Spacewatch (University of Arizona). These observatories are constantly upgrading their capabilities to try to catch fainter asteroids. Asteroids are also observed from space by several telescopes, but the one most regularly used for NEO searches is called NEOWISE. 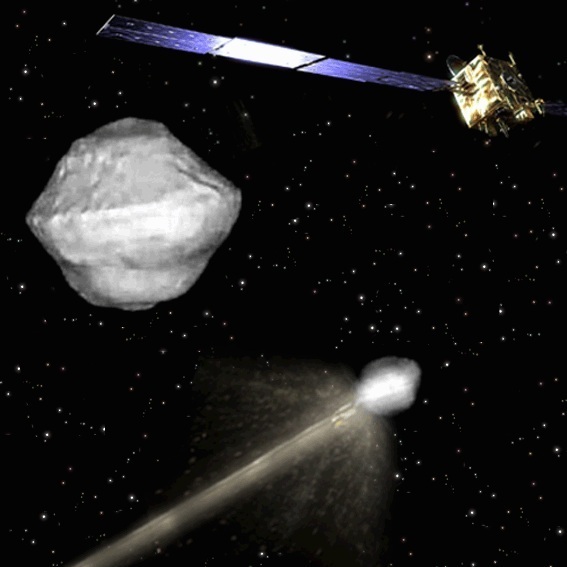 It’s the new mission of the Wide-field Infrared Survey Explorer (WISE) telescope, which launched in 2009 and was revived from hibernation in 2013 to search for asteroids. The telescope is expected to keep operating until 2017, when the angle from the sun in its orbit will be too bright to search for asteroids. A follow-up mission called Near Earth Object Camera (NEOCam) has been proposed for 2021, but is competing against five other missions for funding. Mission selection will be announced in September 2016. There are other NASA missions that are looking to get up close to asteroids to better characterize their composition. Some recent examples: The Dawn mission visited asteroid Vesta between 2011 and 2012, and has now been at Ceres (a dwarf planet) since 2015. OSIRIS-REx (Origins, Spectral Interpretation, Resource Identification, Security, Regolith Explorer) is expected to depart for asteroid Bennu in 2018 for a sample-return mission, which will come back to Earth in 2023. Additionally, NASA uses data available from other space agency missions that visited asteroids, such as the Japanese Hayabusa (completed) and Hayabusa 2 (in progress). Some planned missions will take even more daring steps at asteroids. NASA has been working on concepts for an Asteroid Redirect Mission (ARM) that would have a robot move a small body into the moon’s orbit, for astronauts to study. Also: NASA, the European Space Agency and other partners are planning a mission called AIDA, or Asteroid Impact and Deflection Assessment. The goal is to change the path of a small moon orbiting the asteroid Didymos using a kinetic impactor. A kinetic impactor (perhaps with a nuclear bomb inside) would deflect the orbit, tugging the asteroid slowly using a spacecraft, redirecting it with solar heat, or blasting it with a laser. That is just one idea. There is ongoing research as to what sort of asteroid deflection technique would be best. The best approach depends on many factors, such as cost, the composition of the asteroid, time to impact and technology maturity. Studies are ongoing in these fields; in 2007, NASA said that non-nuclear kinetic impactors had the most mature technology. An international team of scientists including Stanford researchers unveiled new findings on understanding the dynamic behavior of galaxy clusters and ties to cosmic evolution. Working with information sent from the Japanese Hitomi satellite, an international team of researchers that include Stanford scientists has obtained the first views of a supermassive black hole stirring hot gas at the heart of a galaxy cluster, like a spoon stirring cream into coffee. These motions could explain why galaxy clusters form far fewer stars than expected – a puzzling property that affects the way cosmic structures evolve. The data, published today in Nature, were recorded with the X-ray satellite during its first month in space earlier this year, just before it spun out of control and disintegrated due to a chain of technical malfunctions. 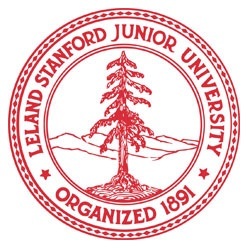 KIPAC is a joint institute of Stanford University and the Department of Energy’s SLAC National Accelerator Laboratory. Galaxy clusters, which consist of hundreds to thousands of individual galaxies held together by gravity, also contain large amounts of gas. Over time, the gas should cool down and clump together to form stars. Yet there is very little star formation in galaxy clusters, and until now scientists were not sure why. About 15 percent of the mass of galaxy clusters is gas that is so hot – tens of millions of degrees Fahrenheit – that it shines in bright X-rays. 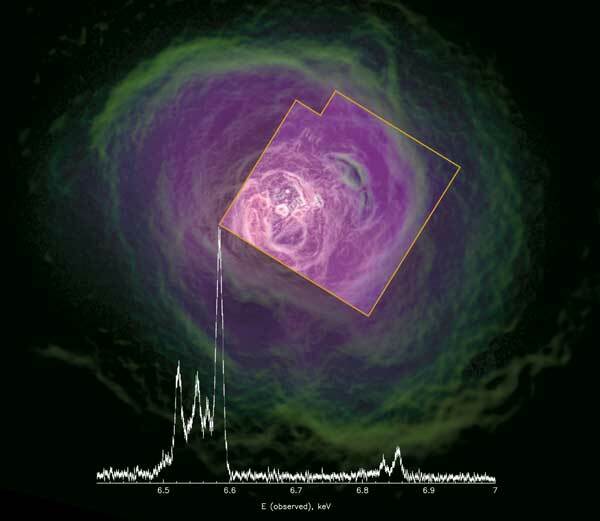 In their study, the Hitomi researchers looked at the Perseus cluster, one of the most massive astronomical objects and the brightest in the X-ray sky. 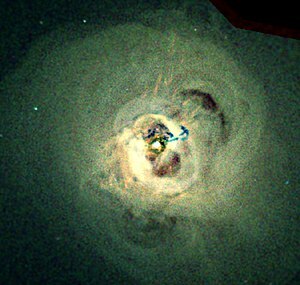 Other space missions before Hitomi, including NASA’s Chandra X-ray Observatory, had taken precise X-ray images of the Perseus cluster. 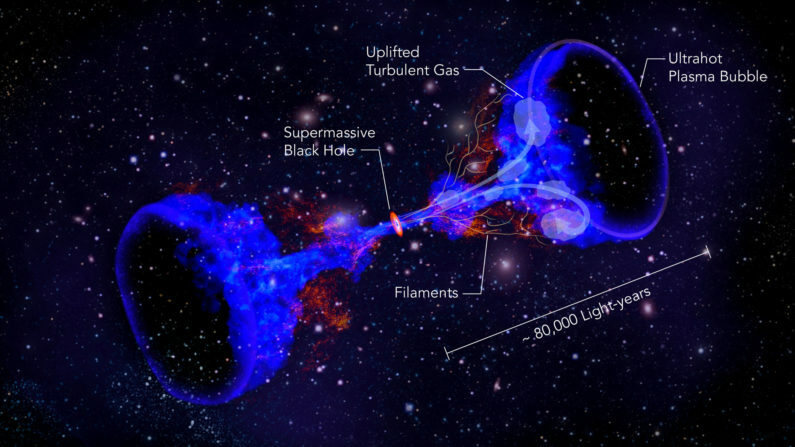 These snapshots revealed how giant bubbles of ultra-hot, ionized gas, or plasma, rise from the central supermassive black hole as it catapults streams of particles tens of thousands of light-years into space. Additional images of visible light from the cluster showed streaks of cold gas that appear to get pulled away from the center of the galaxy. However, until now it has been unclear what effect the plasma bubbles have on this intergalactic gas. To find out, the researchers pointed one of Hitomi’s instruments – the soft X-ray spectrometer (SXS) – at the center of the Perseus cluster and analyzed its X-ray emissions. By superimposing this map onto the other images, the researchers were able to link the observed motions to the plasma bubbles. Astrophysicists can use the new information to fine-tune models that describe how galaxy clusters change over time. One important factor in these models is the mass of galaxy clusters, which researchers typically calculate from the gas pressure in the cluster. However, motions cause additional pressure, and before this study it was unclear if the calculations need to be corrected for turbulent gas. Although the loss of Hitomi cut most of the planned science program short – it was supposed to run for at least three years – the researchers hope their results will convince the international community to plan another X-ray space mission. Hitomi is a joint project, with the Japan Aerospace Exploration Agency (JAXA) and NASA as the principal partners. Led by Japan, it is a large-scale international collaboration, boasting the participation of eight countries, including the United States, the Netherlands and Canada, with additional partnership by the European Space Agency (ESA). Other KIPAC researchers involved in the project are Tuneyoshi Kamae, Ashley King, Hirokazu Odaka and co-principal investigator Grzegorz Madejski.